In light of the much hyped flu season and other air borne pollutants , it makes sense to keep the air in your home and office clean of microbes. A week off work due to illness might cost you more than the Powerful, Smart, and Advanced - 9 Stage Air Shield Air Purifier. About 12 years ago we bought what we thought to be a cutting edge air filtration system that could single handedly purify all the indoor air in a 3000 sq ft house. We paid $549.00 for that unit. It produced so much ozone you could literally smell it especially when you went outside for a few minutes and returned in the house. We were warned about this smell so we accepted it. It was supposed to ionize dust floating in the air and bring them to the floor, but you could still see some dust floating all over our home. Believe it or not the filter didn't even have a basic HEPA filter, originally developed by the Atomic Energy Commission to remove radioactive dust from their manufacturing plants and are currently recommended by the U.S. Department of Homeland Security. The 9-Stage Air Shield Air Purifier not only incorporates the most advanced HEPA technology and comes complete with more the air borne, germ fighting technology found in the $549.00 air filter we bought. The Advanced 9-Stage Air Shield Air Purifier as its name suggest has a total of 9 technologies working in synergy in one awesome unit. Folks it just doesn't get better than this. Compare the Air Shield with other leading brands for yourself. Now all this is not to say that we don't like our $549.00 air filter. We do and it still works even after 12 years. It served us well. When our 16 year old was 4 he sometimes had asthma and we believe that it helped him with that, but the Advanced 9-Stage Air Shield Air Purifier is so much more for less. If you take the time to learn of the details below, you will understand what we are saying. 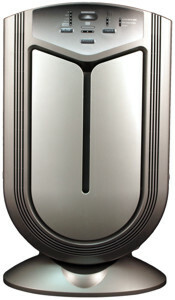 At Microwaterman.com we work hard to bring you the very best products, and this is what led us to the Advanced Ultra-Pure™ 9-Stage Air Shield Air Purifier. It utilizes combinations of 9 separate state-of-the-art technologies to assure that our customers have cleanest air available. With the use of all of these technologies we feel confident that you will have the healthiest, cleanest, most odor free home, office and automobile environments available. How does the Automatic Air Quality Sensor work? 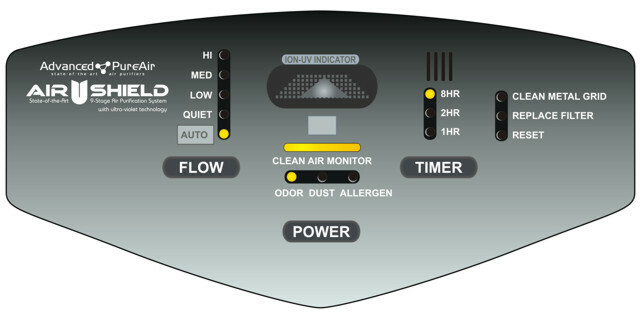 The “Function” setting on the Air Shield allows the user to turn on the Automatic Air Quality Sensor. When turned on, the unit continuously samples the surrounding air through a small opening on the front of the unit. When the quality of the air falls to a pre-determined minimum level the air purifier will automatically turn on. If the unit senses a small rise in the surrounding pollutants, such as an increase in pollen from an open door, it will turn the fan on low. If the senor detects a large rise in pollutants, such as someone smoking a cigar, it will turn the fan on high. The Automatic Air Quality Sensor makes it easy to assure that you always have maximum air quality with a minimum level of attention, courtesy of this powerful and smart Ultra-Pure™ 9 Stage Air Shield Air Purifier. There is simply nothing like it! The Advanced Ultra-Pure™ 9 Stage Air Shield Air Purifier has a common sense feature that alert you when it's time to replace filters, the UV light or clean the collector grid all designed to guaranty your system is working at peak performance. The Advanced Ultra-Pure™ 9 Stage Air Shield Air Purifier is equipped with washable ultra-fine open cell pre-filters to remove larger particles of dust, soot, pollen and pet hair and dander from the air coming into the unit. The foam pre-filters remove most of the larger pollutants and allergens you can see on a nice sunny day, before they even have a chance to reach the HEPA or other filters. These washable pre-filters also help extend the life and maximize the efficiency of the HEPA filters and the unit as a whole. Yes, some technologies are simple but loaded with common sense like the foam pre-filters which can be washed and reused. What a smart idea. The Advanced Ultra-Pure™ 9 Stage Air Shield Air Purifier is equipped with an Electrostatic Dust Collector that functions as an electric dust collector trapping dust, soot, pollen, molds, pet dander, and most other airborne pollutants that pass through the Foam Pre-Filters. Like the Foam Pre-Filters, the Electro-Static Precipitator is washable and never needs replacing. The Electrostatic Dust Collector can be easily removed from the unit for cleaning. It is sometimes difficult to improve on some technologies and Activated Carbon is one of those technologies. Needless to say the Advanced Ultra-Pure™ 9 Stage Air Shield Air Purifier is equipped with a high grade Activated Filter. For a more information on the versatility of Activated Carbon filters study this LIST OF CONTAMINANTS THAT CAN BE EFFECTIVELY FILTERED BY ACTIVATED CARBON FILTERS. Putting these technologies together as you find in the Advanced Ultra-Pure™ 9-Stage Air Shield Air Purifier provides unsurpassed peace of mind, and the unintended consequence of hurrying to get home. 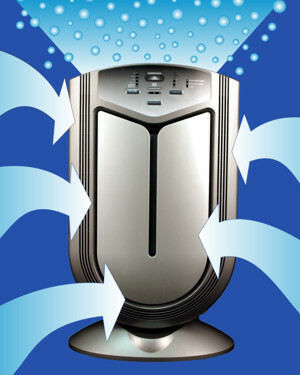 The Advanced Ultra-Pure™ 9-Stage Air Shield Air Purifier is fully equipped with high-efficiency HEPA filters. 100% of the air purified by all the Ultra-Pure™ home and room units passes through a HEPA filter during the second or third stage of our purification system. This is the best particle filtration available today for suppressing solid and liquid airborne particles including household dust, soot, pollen and even some biological agents like bacteria and germs. While HEPA filters are very effective against most solids and many biological agents as stated above, they are not particularly effective against odors, gases and gaseous particles. This is were the Activated Carbon Filters come in. equipped with Ultraviolet Light Air Purification to kill airborne microbes. UV light is highly effective in helping fight biological based diseases caused by viruses, bacteria’s, and molds. This micro-organism fighting technology is recommended by numerous government and private agencies including the Centers of Disease Control, the Air Institute of Respiratory Education and the Air & Waste Management Association. 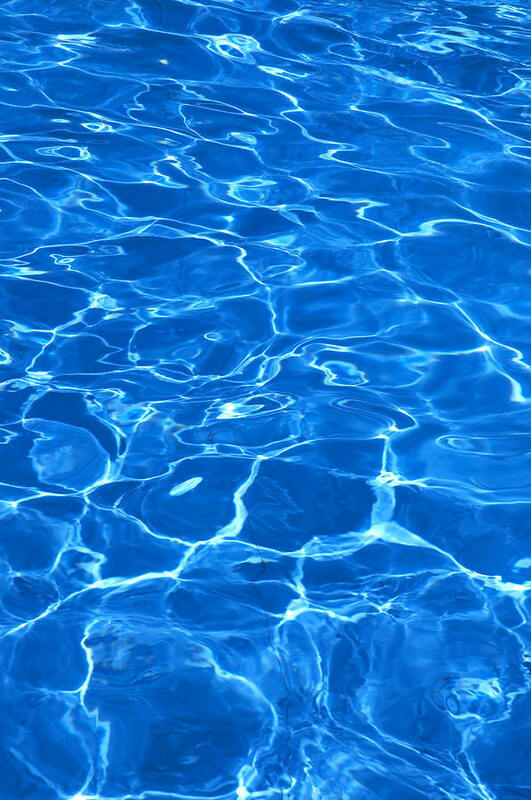 It is also commonly used in many health care facilities to sterilize both the air and medical equipment. How does UV Light Air Purification work? It is important to note that the Ultra-Pure™ Air Purifiers, shield direct ultraviolet light from escaping from the inside of the unit, exposing direct UV light only to the air that passes through the air purifier making them safe to use anywhere in your home or office. 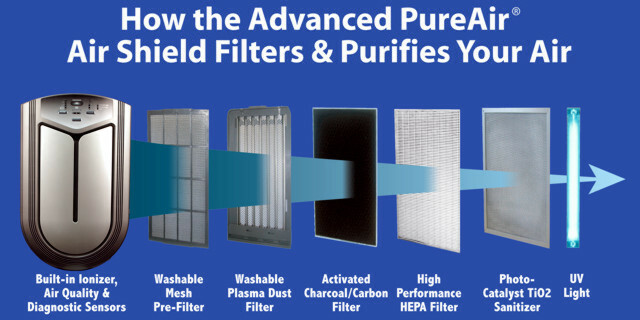 The Advanced Ultra-Pure™ 9-Stage Air Shield Air Purifier comes equipped with a technology called Photo-Catalysis TiO2 air purification grids. When coupled with a 254 nm (nanometer) UV light, the Ultra-Pure™ 9-Stage Air Shield air purification system is significantly more effective at killing airborne biological agents than HEPA only or HEPA and UV only systems. Nothing was spared to bring you the very best in air filter technology. Titanium Dioxide also referred to by its chemical formula TiO², is harmless, opaque and approved for use in many products by the FDA. This is another example of the synergistic design of the Air Shield. The Ultra-Pure™ multi-stage purification system effectively eliminates many molds, bacteria, viruses and germs as well as helping to neutralize fumes, vapors and chemical odors. The Advanced Ultra-Pure™ 9 Stage Air Shield Air Purifier also comes with full-time Negative Ion generators which you can find in the super high priced air purifiers. These ions are always produced while the air purifier is turned-on and help continuously purify the air outside the unit. Folks nothing was left out of this unit that is counted as being effective at cleaning the air you breath. Please take the time to learn the many health benefits of negative ions. In nature, negative ions are created by sunlight, lightening, ocean waves and waterfalls. Unfortunately, urbanization has significantly disrupted the natural production of negative ions. However, Ultra-Pure™ Air Purifiers ceramic plate technology is able to electronically generate negative ions at a density even Mother Nature can’t match. Nothing was spared in bringing you this state-of-art designed air filter. The multiple points at which air can enter the unit serves to maximizes air flow through the unit and facilitates efficient and effective cleaning of the air you breath. Intuitive Control Panel - Easy to read and understand. Don't you think anybody can figure these controls. If it was this easy every body would be able to fly an air craft. It tells you when to clean the grid, when to replace the filter, and of course reset after each change. However as a backup you can contact us if you need assistance. cfm: cubic feet per minute | cfh: cubic feet per hour | dB: decibels | Hz: hertz | W: watts | mm: millimeters | NM: nanometers | Air Exchange Rate: The time needed to filter the air once in the applicable area. Ultra-Pure warrants air purifiers to the original consumer purchaser to be free from defects in materials and workmanship under normal operation and use for a period of one (1) year, from the date of original purchase. Under the terms of the warranty, Ultra-Pure will repair or replace any defective part(s) free of charge. Upon discovery of a product defect, within the warranty period, you should immediately notify Ultra-Pure via telephone, email or fax to obtain product return and shipping instructions. You should send the product, shipping charges prepaid, to the designated service location, accompanied by your name, address and telephone number, proof of purchase date and a description of the defect. The warranty does NOT include unusual wear, damage resulting from accident or unreasonable use and also does not include replacement filters, bulbs, aroma scent nor other disposable parts and supplies.